I’m going to preface this review by saying I am a diehard Phillies fan, and the ’08 World Series win was one of the best nights (or two, if you know what I mean…rain…) in memory. 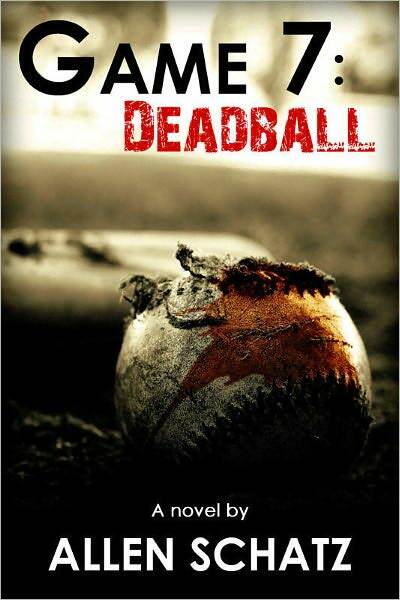 The plot summary of Allen Schatz’s Game 7: Dead Ball sounded like an interesting story, but the fact that it takes place during that series made it a must buy. But what I found was that the story itself drew me in far more than the teams playing. As a matter of fact, I was so into the plot and characters, I glossed right over mentions of the games themselves. Game 7: Dead Ball follows the lives of childhood friends who have all gone in different directions since their college days. The main character, Marshall Connors, is called in to umpire the World Series because of the medical status another, and now must deal with umpiring for old friends. However the plot isn’t centered around Connors’ reluctance to call a ball outside on the Phillies’ star pitcher – rather, it’s the life and death situation he’s put in by murders and kidnapping. I won’t get too in depth into the plot – several other reviews online do an excellent job of it, as does Schatz’s book description. I’d just like to praise the writing style, the plot line, the deep characters, realistic dialogue, suspenseful chapter endings, fantastic local scenery (being from near the Philly area, I can see Schatz knows Philly as well), and thrilling conclusion. One thing I do want to make an important note about: Game 7: Dead Ball was one of the cleanest, most well-written works I’ve seen to date from an independent author. Schatz has not only crafted an excellent story line with lifelike characters, but he’s done it sans typos and awkward sentences, something that always pulls me out of a story. Here? Nothing of the sort. The only possible negative I can even remotely think of is that Schatz introduces main characters that all have significant roles in the story, and I sometimes lost track of them. Then again, perhaps because of my own work situation and not being able to read it straight through (took several weeks), that’s my own fault for losing track! Game 7: Dead Ball was one of the best novels I’ve read all year, and I’ve already picked up Schatz’s sequel, 7th Inning Death, which picks up with Marshall Connors again. Highly recommended for all suspense, mystery, and most especially, baseball fans. A no-brainer for the price of a venti latte…seriously. Available at Amazon and Barnes & Noble, or at the author’s site here. Interference starts off with a bang, literally. I won’t be giving anything away by saying this, as the book jacket reveals it, but the dramatic assassination of the President of the North American Union sets events into motion that turn a science fiction novel into more of a suspense/mystery, and Blackstone definitely keeps the pages turning. However, that’s not saying it’s not science fiction! Some fascinating ideas Blackstone has written into Interference. The Kingdom, man-made terraformed area in the far northern reaches of the North American Union, populated supposedly by backwater barbarians. Sonic shields that snap into place at a threat detection. Mech assault robots with impressive weaponry. 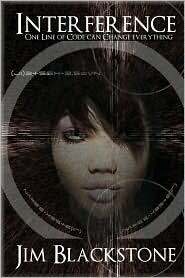 Cloning and genetic engineering to create better and better humans. Floater vehicles that can be shut down by command of authorities, or tasked to hunt. Blackstone weaves the ideas well into the overall story, never overemphasizing them, and perhaps more importantly, never violating the “Show, Don’t Tell” rule. I found the story to be compelling, and I was actually more drawn to the character of Detective Henry Corvasce as opposed to Damien Reyes, the one blamed for the President’s killing and the one each chapter starts off with (Reyes being interrogated in a unique fashion – interrogated for lack of a better term that might give away part of the storyline). Corvasce made for an excellent main character; deep, well-written, believable, and likable. If another story is to follow, I hope that Blackstone brings back Corvasce as the primary character in another mystery-type setting. Sections of the story do get very complex at times, as Blackstone has certainly done his homework on quantum physics and mathematics, but no so much as to get lost in. The book was well-edited; minuscule typographic errors, I don’t even think I can count them on one hand, and certainly far fewer than I’ve seen in mass-market novels. My only comment (because gripe would be far too strong a term) would be the ‘interrogation’ at the beginning of most chapters is all dialogue in quotation marks, and with some of the dialogue being multiple short statements, I did find myself having to read back a few lines to really determine who was speaking. But that in no way whatsoever took away from the overall mystery/suspense story, the excellent characters, and the resolution at the end I was very much looking forward to reading. Blackstone has put out a good story – entertaining, good characters that are well-developed, an intriguing political mystery with science fiction settings and technology. I can certainly recommend Interference. A few weeks back, I was privileged enough to twitterview* Dr. Kerwin Swint, author of The King Whisperers. *Twitterview – what a cool word, huh? Even cooler concept. Following along with a Twitter hashtag (#emlyn) and creating a real-time, online dialogue, audience members from around the world can peek in, see Q&A, and even throw in a question or two. I had a blast in March doing several! Going into it, before taking a look at his work and the overview of his book, I had read that he was a professor of politics at Kennesaw State University in Atlanta. So…thinking back to a poli-sci course I had in college, with possibly the most droll and monotone professor I had in my four (well, four and a half) years there, I was hesitant. Perhaps this wasn’t such a good idea…how interesting could a professor of politics be, and would anyone care enough to ask questions? Just a few minutes into the twitterview, I found Dr. Swint incredibly engaging, personable, knowledgeable, and really down-to-earth. At the end of the standard questions, audience members jumped in with some great questions, and Dr. Swint had some equally top notch answers. After it was over, I had to (a) rethink my bias towards poli-sci professors, and (b) make it a point to get a copy of The King Whisperers. The first was easy, since I’m not sure how many more professors I’ll run into in the future, but the second took a couple of weeks. Once I received it, I dove into it, and my goodness, it turned out to be a truly fascinating book. 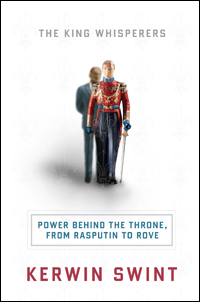 A: Mostly politics and history: The King Whisperers tells the stories of some of the greatest power brokers and manipulators in history. Q: Who were the most fascinating ‘evil geniuses’ you found when researching the book? A: My favorites are the really bad guys, the young Stalin, Hitler’s right hand, but also today’s power brokers like Cheney and Rove. Q: There are so many “whisperers” for every leader nowadays. does this, and pollsters especially, diminish the power of the electorate? A: The messages get clouded up with partisanship and ideology, which is too bad. Q: When it comes to writing political, historical fiction, how soon is “too soon” when covering an event? A: Great question, cause over time the details and interpretation can change, can’t they. Usually it takes 5 or 10 years for context. Q: Sooo…. how is Obama doing? A: Toughest job in the world. would probably be reelected today, but who knows about 2012! As for the book itself, I found it to be an incredible peek behind the scenes of some of the most famous and most powerful leaders in history. Machiavelli, Che Guevara, Rasputin, and dozens more, all arranged by “type” – whether they be Fixers, Schemers, Kingmakers, Empire Builders, Rebels, or Silver Tongued Devils. This non-fiction book never read like a history text, which could be how it appears from the cover, book jacket, and overall theme. It was very well-written, done in layman’s terms, easy to read, and actually hard to put down. The fact that this figures existed, and the stories are so fascinating, makes it an excellent read. I’ve never been a history reader, but I can absolutely recommend The King Whisperers just from the standpoint of a reader in general. 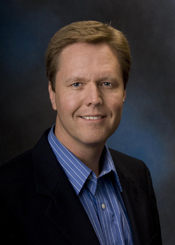 Take a peek at Dr. Swint’s site, as well as some really interesting trailers below. Please vote for my blog in the traffic-breaker poll for this tour. The blogger with the most votes wins a free promotional twitterview and a special winner’s badge. I want that to be me! You can vote in the poll by visiting the official King Whisperers blog tour page and scrolling all the way to the bottom. The next word for the book give-away is HELPING. Learn more about the give-away and enter to win 1 of 3 copies on the official King Whisperers blog tour page. The other 2 copies are being given-away courtesy of the GoodReads author program, go here to enter. 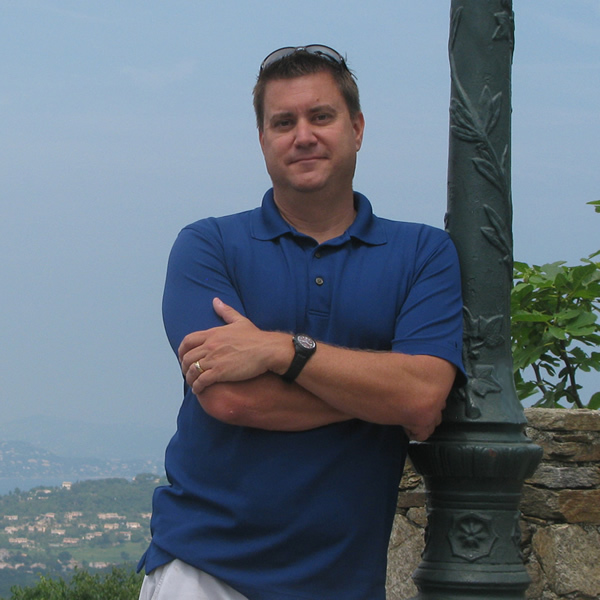 And don’t forget to stop by the Q&A with Kerwin Swint Group to discuss the King Whisperers (including questions from the official book club guide), the author, and his previous works. A hired hit man who previously worked for the mafia. An innocent friend by his side. A corrupt corporation with leak. A gruff CEO with a mysterious and beautiful security agent. A target with questionable morals and a shady lifestyle. This is the cast of characters put together in Loose Ends, a thriller novella from debut author AJ Powers. It’s a short novella, borderline long short story (sorry for the oxymoron), but a very entertaining read. A hitman is sent to clean up a loose end, but finds he gets closer to the job than he expected. Good story flow, page-turning, and realistic dialogue and settings. 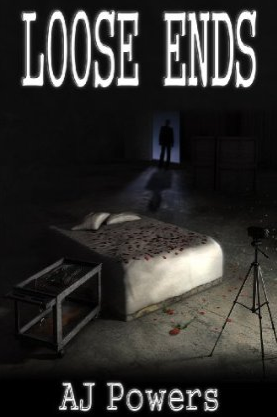 This is an absolute no-brainer priced at $.99; I’d certainly recommend Loose Ends for a quick, entertaining thriller. Oh, and Powers designed and created the cover art from scratch – an enviable talent to have. Quick disclaimer: I met AJ online a while back when he was working on Loose Ends, and even gave him a brief beta read on his first draft, so I had a little insight into the story before it hit the digital shelves. I was impressed with the story, and even more impressed that he took several beta readers’ suggestions before releasing the final copy, and turned out a fairly polished debut. When a greedy corporate power threatens the status quo in Weber Rexall’s town and he’s tasked to do something about it, nothing will stand in his way. 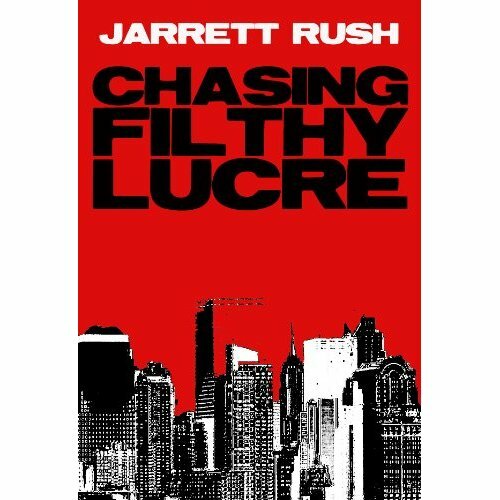 Tough guy Rexall, his underground fighting ring cohort Berger, and a synthetic Serve-O named Simmer are just three of the incredibly interesting characters Rush writes into Chasing Filthy Lucre, the first part in a novella series, one that entertains right from the first page. Rush seamlessly blends cyberpunk technology and post-apocalyptic settings with deep characters the reader can truly feel for. The tech itself is fascinating; without giving anything away, when Rush describes the hothouse and its patrons, the remarkable imagery he puts together could easily have been pulled from a scene in today’s world. The scene descriptions, such as the underground fighting and the ‘package delivery’ scene (again without giving too much away) are rich, and really paint a detailed picture in the reader’s head. The story is fast-paced and progresses logically, with a couple of twists, and an exciting climax, then easily feeds into the next novella in the series. Definitely a page-turner, and very well edited for a self-published work. Absolutely worth the download, I’m looking forward to the next in the series! Mekans…even the name sounds foreboding. Machine intelligence, stripping the resources of planet after planet, making their way across the galaxy, leaving burned out husks in their wake. The only hope for the survival of countless species are The Chosen, small groups of four different species who are watched over and trained by Guardians from the planet Gentra. The Gentran prophecy says The Chosen hold the key to defeating the Mekans, but when one Chosen is killed, the prophecy may be in jeopardy. 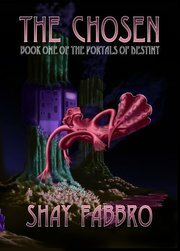 This is the epic science fiction/fantasy story Shay Fabbro has begun to weave with Book One of the Portals of Destiny. Fabbro paints a vivid picture of five distinct worlds, and pulls it off with no trouble, something many world builders have issues with in just one. There is a wide range of characters, many of which are delved deeply into, enough so that the reader can identify with several at once. Fabbro makes it easy to follow each, as the races are significantly different enough not to get confused. A reptilian warrior race, a clone race, a magical race, and of course, humans – albeit post-apocalyptic. I thoroughly enjoyed the story, from start to finish. The detail in the worlds, the depth of characters, the grandiose far-reaching plot are all done in an easy-to-follow format and style. At certain points I do feel it gets a bit deep into description, but knowing this is the first part of a series, and knowing the full story will not wrap up by the final page, it all makes perfect sense. I felt the mix of science fiction (clones, weaponry) and fantasy (magic, transformations) was very well done. The overall crafting of the story reminded me a bit of The Empire Strikes Back, mixing the science fiction scenes with the Jedi training fantasy aspect. The only negatives I encountered, and completely my personal opinion, would be a little bit of point of view confusion, but only very rarely; and (possible spoiler alert) I felt the key killing of the Chosen happened a little too late in the story (I kept waiting for it to happen, as the ‘book jacket blurb’ emphasizes it). But absolutely nothing that detracts from the overall story, which was well edited…much more so than most independent authors’ works I’ve read before. I’m very much looking forward to Book Two, which I understand is just around the corner, as Fabbro has put together the beginnings of an epic story arc with very interesting characters. And it’s just starting! This was one of the first novels I downloaded for Kindle, as I’m slowly integrating myself into the wonderful world of e-readers. I saw Frost’s name mentioned on a message forum, so I thought I’d take a look. Very eye-catching cover, intriguing blurb, so I decided to grab a sample. I burned through it in one night, got to the end of the sample section, and immediately clicked to buy the entire novel…it was that gripping. Holly Lin is a nanny by day, and assassin by night. Frost takes the character around the world, from Vegas to Paris, from shootouts in the desert to a frantic tractor trailer chase scene, and never takes her foot off the gas (pardon the pun). From page one, the story, the action, simply grab a hold of the reader and doesn’t let go until the breathless end. Holly is part action hero, part innocent young woman, and Frost brings an incredible range of emotion to the character. She writes excellent dialogue and uses the first person perspective very well in bringing Holly’s thoughts and feelings to life. It’s very easy for the reader to get inside her head, and feel the rage, sorrow, excitement, and more. It’s not all gloom and doom, however; Frost weaves humor and one liners into the story well (one I remember, without giving any spoilers, was when introduced to the Russian guard named Boris, she stops dead and says, “Is his name really Boris?”, and later refers to Natasha – all without ruining the pace or plot line, like many other authors I’ve read have done when trying to integrate humor). All in all, an excellent read. Fast-paced, hard to put down, full of characters the reader can truly feel for. I understand Frost is working on a sequel; I’ll be watching for that, no doubt. For a debut work by an independent author, No Shelter is an enjoyable, emotional thriller well worth the reader’s time (and small amount of money). Highly recommended – much better value than a latte! 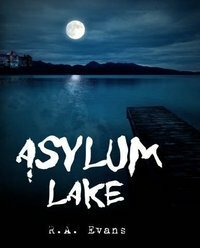 Just wrapped up Asylum Lake by R.A. Evans last night, and I have to say I really quite enjoyed it, even though I’m definitely not a typical horror reader by any stretch. It was very well written, the descriptions were vivid enough to show the scene in one’s imagination, yet not overly wordy. The characters, I thought, were well-developed, and the POV didn’t jump around so much as to lose sight of who was speaking/thinking/feeling. A few chapters in the story and pace really took off, and the chapter where Ellis ‘takes over’ during the car ride (I won’t throw in any spoilers) was excellent. I can always tell when I’m enjoying a scene when I tear through it so quickly I have to make a mental note to slow down. I also felt that the flashbacks, the scene changing from past to present, worked very well for describing the characters and their backgrounds, and it was easy to keep track of where/when the scene was. I’ve read others that simply mix them all up, and the reader gets lost. Evans did a masterful job of keeping the scenes straight and easy to follow. I was a little surprised how…calm might be the word?…the ending was. It was really building up to a crescendo, then the final scene wrapped it all up quietly. That being said it all made perfect sense and tied everything together neatly; Evans made it flow well into a sequel or follow up. Overall an excellent story, well told – recommended for a good read, just not too late at night!